Biting the Big Apple: Perfect day? 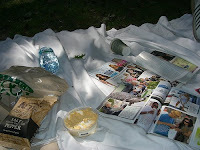 I had a picnic with Larry in Central Park today. I have been dying to have one for years actually, having been deprived of the pleasure by my ex who hated them. So when Larry suggested we spend the day in the park, I jumped at the chance. We met up in Columbus Circle to go to Wholefoods in the Time Warner Centre and get some supplies. Wholefoods is an upscale deli/supermarket with amazing food, albeit fairly pricey – in other words, heaven for the discerning foodie. We stocked up on goodies from the salad bar and deli counter, bought some Chardonnay and stopped at the corner newsstand to fill up on trashy magazines before making our way to Sheep Meadows, a large expanse of green in the Park. The weather was beautiful – clear blue skies and bright sunshine. Larry had brought a sheet (from which a pair of boxer short fell off, provoking fits of laughter) and we positioned it in the shade of a large tree. We spent the rest of the day glossing over the magazines, discussing deep philosophical and world changing issues such as Angelina Jolie’s weight – or lack of – and whether Jessica Biel is in fact pretty – I think we decided she was in the end. We did talk about politics a little though, as every New Yorker does. We ogled at all the semi-naked men who happen to be wondering in our vicinity, definitely confirming the high level of body consciousness of New Yorkers and shaming us into planning to visit the gym more often. I took lots of pictures of Larry wearing his silly plastic teeth for his facebook profile, ensuring that he would never get a date from that site. We talked about our trip to Las Vegas next weekend and whether we should just get very drunk (well, that’s a certainty), do a Britney Spears and get married by an Elvis impersonator in a drive-through ceremony, agreeing to never actually consummate the marriage and to get it annulled the next day. I can picture it already – it will be the only wedding in town where the bride and groom refuse to kiss and we’d get some massively over-weight old gamblers from the Mid-West for witnesses. Pure class. A picnic, gorgeous men, lots of laughter, light-hearted conversation and wedding plans – could this have been the perfect day?